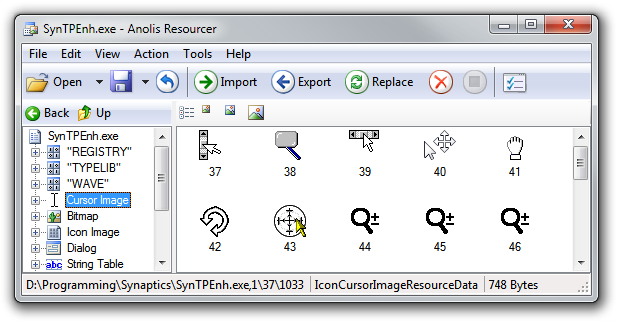 The Synaptics Gesture Suite enables a variety of useful features for supported laptop touchpads. My favourite is ‘ChiralScroll’, which allows you to scroll by making a circular motion on the touchpad. Synaptics actually offers generic drivers on their website now, so you can download them directly without needing to go via the usual websites. I’m misappropriating the ‘Move’ cursor here (a separate metaphor), but I think the image fits with scrolling to some extent. Let me know if you can come up with a better alternative. 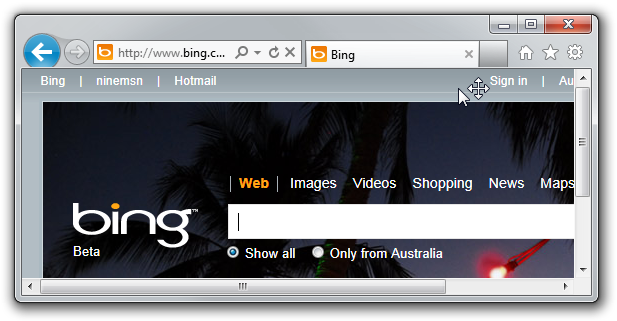 Read on for instructions on replacing the cursor. I take no responsibility if doing this somehow breaks your system. Make sure you keep a backup of SynTPEnh.exe in case something goes wrong. Enjoy your updated cursor. 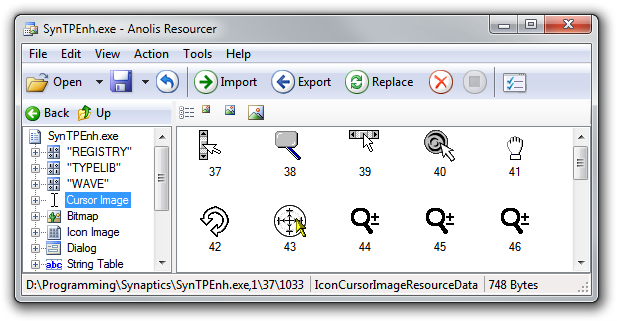 Note that Synaptics doesn’t respect the ‘Enable pointer shadow’ option in Windows. For this reason, I’ve included a shadow in the image itself (but not for the ‘move’ cursor part, as the shadow doesn’t fit in 32x32px). Try ending the SynTPEnh.exe process first via the Windows Task Manager (Ctrl+Shift+Esc). You should also run Anolis Resourcer with administrative privileges. Unfortunately there’s no guarantee that my version of Synaptics is the same as yours, otherwise I’d upload the executable file. If you get stuck with any of the steps in this article, let me know. where did i save it? how do i save it?